intra#2 commission for Tambor Fantasma, 7 april, buenos aires, argentina. performance at Algorithmic Art Assembly, 23 march, gray Area Foundation For The Arts, san francisco. 10 channel fm synthesis in collaboration with okkyung lee, 21 march, issue project room, new york. sensate focus live at Ochiai Soup tokyo, 6th october . the algebra of listening 2-3 december kolkata, 6-7 december chennai, 15-16 december fort kochi. ROAR group show, st anns school rotherham. screening: Every object is the mirror of all others rotherham ROAR art space. computers and collaborative music making exhibition with luke fowler, whitechapel london. performance of focal music #3 with laura cannell at baltic 39 newcastle. to the editor of amateur photographer film with luke fowler screening at MOMA nyc, 16 november. 71st presentation of multistability live with rpboo, tropical waste @ waiting room, stoke newington, 29 october. 70th presentation of multistability live prague, 26 october. sensate focus live nextsound kiev,23 october. 69th presentation of multistability live at the lab san francisco. premier of recursive frame analysis, empac troy ny. factoid#3 and 68th presentation of multistability live, send and receive festival, winnipeg. 66th presentation of multistability live moscow. object relations 1 live with sandro mussida, moscow. premier of no more mind games cafe oto, london, as part of editions mego anniversary event. premier of soundtrack for volcano university of york uk. hek, basel with keith fullerton whitmann. sensate focus live, powerhouse, moscow. a pattern for becoming performance with 7 moveable speakers and solo cello, featuring okkyung lee, blue room, royal festival hall, london (UK). action for sky dancers, generative rhythm and strobe 20th feb, roulette new york, action for sky dancers. 21th feb, empac troy (ny), collaborative performance with keith fullerton whitman. one dimensional music without context and meaning 27th feb, yale union portland (or). object relations exhibition southfirst gallery nyc. 59th presentation of multistability live 15th march, the empty gallery, hong kong. 8 rectangular waveshapes? 20th march, nk, berlin. a pattern for becoming performance with 7 moveable speakers and solo harp, featuring rhodri davies, blue room, royal festival hall, london (UK). to the editor of amateur photographer film with luke fowler looking at the early history of pavilion women's darkroom and photography gallery, commissioned by pavilion. premier hyde park cinema leeds, 22 november 2014.
conference and workshop tunis science city? long mix? boston, at the Metropolitan Waterworks Museum hosted by non event. light installation with jon howse, reader in soft matter, at university of sheffield, part of festival of the mind 2014.
sonic uncertainties, the multidimensional case, installation, university of york uk with Tim Croudace, Professor of Psychometric Epidemiology university of york uk. forget amnesia, serpentine park nights event with haroon mirza and okkyung lee featuring multistability live and a new version of 8 rectangular waveshapes with variable pulse width and phase locked blue light? 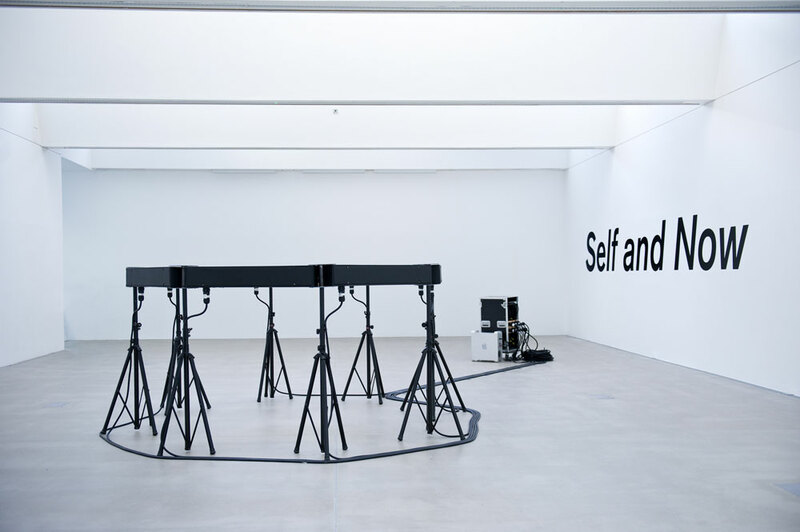 http://www.serpentinegalleries.org/exhibitions-events/park-nights-2014-forget-amnesia-haroon-mirza-mark-fell-and-okkyung-lee. second performance of one dimensional music without context and meaning developed at EMS stockholm and EMPAC troy (name etc coming soon) at transformer station, cleveland museum of art, cleveland. premier of one dimensional music without context and meaning developed at EMS stockholm and EMPAC troy (name etc coming soon) at lampo in conjunction with Graham Foundation for Advanced Studies in the Fine Arts at Madlener House, chicago. music of the eternal now: post-husserlian temporality, pattern cyclic time-consciousness and computer music here http://issueprojectroom.org/drupal/event/rashad-becker-valerio-tricoli-mark-fell 20 june, pan festival new york. action for sky dancers, generative rhythm and strobe macba barcelona. first presentation of n-dimensional analysis 31 may, arnol fini with mika vaino and bee mask. music of the eternal now: post-husserlian temporality, pattern cyclic time-consciousness and computer music 28 may, leeds, including a presentation by rian treanor of multistability system 4.
action for sky dancers, generative rhythm and strobe - berlin berghain as part of club transmediale. snd live at zkm with raime, 2 feb.
pattern synthesis seminar-workshop? at Kultur Vaerftet helsingor denmark. factoid #3 at oddstream art, technology, multimedia expo 26 27 28 October 2012, nijmegen, the Netherlands. 19th performance of multistability live kraak gallery manchester. Design of KTL V cd and 12" vinyl. Client Editions Mego Vienna. snd live at ART+COMMUNICATION 2012 Art of Resilience 14th International Festival for New Media Culture riga 5th october. snd live at yellow arch studios as part of tramlines festival sheffield 21st july. snd live at pan showcase - shacklewell arms, london 10th june. installation of tone pattern transactuality at artisphere arlington september to november 2011 as part of the Datafields exhibition. 10th performance of multistability live at the Middlesex Lounge boston, 20th october. 6th performance of multistability live at cafe OTO london 28th sept.
5th performance of multistability live at bold tendencies, level 8 peckham multistorey car park. multichannel performance of The Occultation of 3C 273 at active crossover, armley mill, july 1st with joe gilmore. 4th performance of multistability live featuring 12 speaker ambisonic panning at blank canvas, village underground, london. 30th june. 3rd performance of multistability live room 1013, hyatt regency, montreal 7th may 2011 to invited audience followed by questions and answers. 1st performance of multistability live at listen up event shalesmoor sheffield. mirrors, laser and multichannel sound installation at LISTEN UP sound art exhibition at Creative Arts Development Space, Sheffield. composition three point zero quadraphonic performance at the Music Research Centre, York. exhibition attack space decay time at enjoy artspace leeds. 26th feb to 11th march 2011.
five spatial transforms a series of 5 giclee prints produced and exhibited as part of attack space decay time at enjoy artspace leeds. snd live at rex club paris with byetone on the 26th of january 2011.
coherence and proximity solo show at woodmill south london. it Hz installation and performance with high power white laser and multi-channel sound and factoid#2 installation with strobe light, orange balloon and three channel sound, chromotologies, rotherham uk. Generative Film and Performance an event at the Birkbeck Cinema London, on the 26th July at 7pm. The Computer Arts Society presents, curated by Ernest Edmonds. Studies in synthesis and geometry three channel sound piece shown at 'enjoy' artspace leeds. attack on silence screening as part of Exposicion ARTe SONoro at La Casa Encendida, madrid http://www.lacasaencendida.es/ 17th may 2010.
attack on silence high definition 8.2 channel performance at isomorphism and totality sensoria 2010, sheffield. performance and installation at sonic materialities, millennium galleries sheffield. snd @ aanen lumo helsinki http://www.charmofsound.org/ on the 12th of november. djing at 'heat haze - radical sound practices' at the woodmill neckinger depot london se16 3qn (see http://www.woodmill.org/heathaze.html) on the 21st of august. full line up includes z'ev, evol and others. light installation st marys church rawmarsh, rotherham. attack on silence excerpt screening here http://www.flatpackfestival.org.uk/09/festival/event/cyrk 15th march birmingham. snd live 4-06 electric campfire @ villa massimo rome. snd live 28-01 snd @ club transmediale, club maria, berlin. vibration white finger, b!as festival of sound arts, taipei fine arts museum (taipei). port hacking #4, el sonido de la velocidad at centre de cultura contemporania de barcelona (barcelona) short recorded exerpt of work made during a residency at UTS in sydney. w+w, generative film, salon (tokyo). untitled 1, with ernest edmonds shown at graphite (singapore). untitled 2, with ernest edmonds shown at siggraph (la). vibration white finger, screened: graf media gm (osaka), mediatheque (sendai), center for arts and media (yamaguchi), laforet museum harajuku (tokyo). tshirt for salon magazine, tokyo. snd us tour with autechre and rob hall. europe tour as snd with autechre and rob hall. snd, city screen bi monthly dj residency (york). port hacking #4 time based av "sonar festival of advanced music and multimedia" (barcelona). wxw live sound and 2 screen performance work shown at "ultrasound" (huddersfield). untitled work for sensor+16mm with yasunao tone (york). sonographia work for projection and graphics tablet with yasunao tone (york). elsewhere performance with jez potter millenium galleries (sheffield). coming of age in south yorkshire performance with 2 screens shown at "earrational festival" (den bosch). remote desktop performance work for remote desktop with mat steel (york). port hacking #1:4 interactive sound and image performance with ernest edmonds "sparks" opening of creativty and cognition studios (sydney). dirty protest interactive work for light sensors made during residency at hong kong national film archive, "videotage/microwave" festival (hong kong). hikari no mandala interactive sound and light with mat steel and haruo ishii, commissioned by "sightsonic digital arts festival" (york). snd all tommorows parties (camber sands). snd La Casa Encendida (madrid). firecircle2 sound design for a public installation work with harou ishi shown at "media select" (nagoya). living without a water feature interactive work with george saxon shown at loughborough school of art and design gallery (loughborough). untitled work with softboard and hyrogliphics collaboration with yasunao tone shown at "creativity and cognition research studios" (loughborough). graphic works idea - international journal of graphic art japan 2002.
japan tour as snd with vladislav delay/luomo and akufen. liquid room (tokyo), the garden (kyoto), club metro (kyoto), club daughter(nagoya), rockets (osaka), cay (tokyo). snd frequencies[hz] audio-visual spaces, schirn kunsthalle (franfurt). snd bios history of video games (athens). snd game on opening, barbican(london). snd raster noton event (chemnitz). snd mutek festival at ex centris (montreal). early reflection interactive networked installation commissioned by david corbett exhibited at hull time based arts (hull). nightstrings pt.2 interactive light/sound installation with lightsensors, shown "national centre popular music" as part of lovebytes (sheffield). snd off peak @ contact theatre (manchester). snd vector @ modernos (leeds). sndcreative time festival @ the anchorage (new york). mille plateaux tour as snd with vladislav delay, kid606, twerk, gez varley. sonar (barcelona), new forms festival (den haag), impact arts festival (utrect), kunstencentrum vooruit (gent), bsbbis (brussels), volksbuhne (berlin), mousonturm (frankfurt). snd broadcast, nyu radio (new york). nightstrings pt.1 interactive light/sound installation with light sensors, shown at "isea2000" at the batorar light house boat (paris). projected game v.2? interactive installation with floor pads and floor projection shown at graves art gallery (sheffield). post-linear studies 291 gallery (london). remote systems interactive sound work commisioned by lovebytes as part of the year of photographic image. exhibited at ponds forge leisure centre (sheffield). atrium sound installation shown as part of "elastic frontiers" (sheffield). non axiomatic living room speakeasy (sheffield).